Copyrights: ©2015 Ghaly A, Brooks S & Kumar S. This is an open-access article distributed under the terms of the Creative Commons Attribution License, which permits unrestricted use, distribution, and reproduction in any medium, provided the original author and source are credited. The effectiveness of enzymatic transesterification of animal tallow using the enzyme Candida antarctica Novozyme 435 was studied. The effects of oil : alcohol molar ratio (1:1, 1:2, 1:3, 1:4 and 1:5), reaction temperature (35, 40, 45 and 50°C) and reaction time (4, 8, 12 and 16 h) on the biodiesel conversion yield were evaluated in a solvent system using n-hexane. The highest conversion yield of biodiesel was obtained at the 1:4 oil : alcohol molar ratio, 16 h reaction time and 45°C reaction temperature. Increasing the oil : alcohol molar ratio from 1:1 to 1:4 increased the conversion yield of biodiesel by 21.24-82.11%, depending on the reaction temperature and time. The rate of conversion of fatty acid esters to biodiesel increased with increases in reaction time. The reaction proceeds slowly at the beginning and then rapidly due to the initial mixing and dispersion of alcohol into the oil substrate and the activation of enzyme. Increasing the reaction time from 4 to 16 h increased the conversion yield of biodiesel by 13.51-34.07%, depending on the oil : alcohol molar ratio and reaction temperature. The interactions between enzyme polymer surface and substrate appears to be dependent on reaction temperature due to hydrogen bonding and ionic interactions which play important roles in maintaining the thermostability of lipase in the system. The high temperature of 50°C denatured the specific structure of enzymes and resulted in a decrease in methyl esters formation. Increasing the reaction temperature from 40 to 45°C increased the biodiesel conversion yield by 8.48-33.95%. Using n-hexane in the reaction helped to stabilize the enzyme and minimize the toxicity of alcohol. The activity of the enzyme catalyst Candida antarctica Novozyme 435 in the presence of 2-butanol and n-hexane remained relatively stable for 10 cycles and then decreased rapidly reaching 11% after 50 cycles. Biodiesel, Enzyme Transesterification, Novozyme 435, Solvent, Oil:Alcohol Molar Ratios, Reaction Time, Reaction Temperature. The high demand for fossil fuels, their limited and unsecure supply and high cost have prompted the search for alternative energy sources such as biofuels, solar, wind, wave, hydro, geothermal and nuclear. However, renewable biofuels such as biodiesel, bioethanol and biogas from biomass materials are more economical, and environmentally friendly [1-3]. Biodiesel has several qualities over diesel including: being sulfur free, non-toxic, biodegradable and non-carcinogenic . These characteristics make it greener and more eco-friendly than diesel [5-9]. In addition, biodiesel can be used in compression-ignition engines instead of petroleum diesel [10-11]. Biodiesel can be produced from many raw materials including: plant oils, animal fats, microbial mass and waste materials (. Popular plants used as a feedstock are jatropha, canola, coconut, cottonseed, groundnut, karanj, olive, palm, peanut, rapeseed, safflower, soybean and sunflower [6,9-10]. The most popular animal sources used as a feedstock are beef tallow, chicken fat, lamb fat, lard, yellow grease and hemp oil [10.12-14]. The waste materials include: waste cooking oil, greasy by-product from omega-3 fatty acid production and fish waste [6,9]. The main component of fats and oils are triacylglycerols (triglycerides) which are made of different types of fatty acids with one glycerol (glycerine) being the backbone. The types of fatty acids present in the triglycerides determine the fatty acids profile. Fatty acid profiles from plants and animal sources are different and each fatty acid has its own chemical and physical properties which can be a major factor influencing the properties of biodiesel [6,15-16]. Vegetable oils and animal fats can be transformed into biodiesel by the transesterification process. Transesterification is a classic chemical process used to convert the triglycerides (vegetable oils and animal fats) to biodiesel. A short chain alcohol is used to convert the feedstock to methyl esters and glycerin which reduces the viscosity of oil by turning it into biodiesel . Transesterification can proceed with one of three catalysts: acid, alkali and enzyme. With the acid catalyst, the proton is donated to the carbonyl group which makes it more reactive. A base catalyst is used to remove the proton from alcohol which makes the reactants more reactive . However, using acid and alkali requires more energy and a downstream processing step is required for removing the by-product (glycerin) . An enzymatic catalyst can be used to cleave the backbone of the glycerol which makes the reactants more reactive, giving the product without the need for a downstream processing step. The glycerol can be extracted easily and the energy required for the process is minimal. The main aim of this study was to optimize the enzymatic transesterification process for the production of biodiesel from animal tallow obtained from rendering. The specific objectives were: (a) to study the effectiveness of the Candida antarctica Novozyme 435 with the long chain alcohol 2-butanol and hexane as a solvent, (b) to evaluate the effects of oil : alcohol molar ratio (1:1,1:2, 1:3, 1:4 and 1:5), reaction temperature (35, 40, 45 and 50°C) and reaction time (4, 8, 12 and 16 h) on the biodiesel yield and (c) to determine the enzyme stability and reusability. The rendering waste was obtained as beef tallow that had been rendered by the Company S.F Rendering, Centreville Nova Scotia. Samples (10 Kg) were collected and stored at - 20°C in the Biotechnology Laboratory of Dalhousie University. The collected material was yellowish in colour. The immobilized Lipase was an Candida antarctica (Novozyme 435)obtained from Novozyme (Franklinton, North Carolina, USA). The chemicals used in the study included: methanol, n-hexane, tertrahydrofuran, N, O - Bis (Trimethylsilyl)-trifluroacetamide (BSTFA) and hilditch reagent. They were purchased from Sigma Aldrich (St. Louis, Missouri, USA). The fatty acid methyl ester (FAME) standards, which included methyl myristate, methyl pentadecanote, methyl cis-11-eicosenoate, methyl all-cis-5,8,11,14,17- eicosapentaenoate (EPA), methyl erucate, methyl all-cis-7,10,13,16,19-docosapentaenoate (DPA) and methyl all-cis-4,7,10,13,16,19-docosahexenoate (DHA), were purchased from Sigma Aldrich (St. Louis, Missouri, USA). The other FAME standard, which included methyl palmitate, methyl palmitoleate, methyl stearate, methyl oleate, methyl linoleate and methyl linolenate, were purchased from Alltech Associates Inc. (Deerfield, Illinois, USA). The FAME standard methyl-stearidonate was purchased from Cayman Chemical (Ann Arbor, Michigan, USA). The enzymatic transesterification was carried out in order to extract fatty acid methyl esters from the animal tallow by the immobilized Candida Antarctica Novozyme 435as shown in Figure 1. Five oil : alcohol molar ratios (1:1, 1:2, 1:3, 1:4 or 1:5), four reaction temperatures (35, 40, 45 or 50°C) and four reaction times (4, 8, 12 or 16 h) were investigated. The homogenized oil (2.3 ml corresponding to 2 g of fat) was placed into a 50 ml conical flask and heated on a hot plate (PC-620, Corning, New York, New York, USA). The immobilized Candida antarctica Novozyme 435 was added to the flask (25% of the oil weight of 0.5 g). The appropriate amount of alcohol (2-butanol) was added based on the selected oil : alcohol molar ratio (1:1, 1:2, 1:3, 1:4 or 1:5). The solution was mixed using a reciprocal shaking bath (2850 Series, Fisher Scientific, Toronto, Ontario, Canada) at 200 rpm. The desired temperature (35, 40, 45 or 50°C) was selected. After the desired reaction time was completed (4, 8, 12 or 16 h), the enzyme was filtered by vacuum filtration as recommended by Nelson et al. (1998). Samples (100µl) were taken from the mixture and analyzed using a gas chromatograph (Hewlett Packard 5890 series II, Agilent, Mississauga, Ontario, Canada).The same procedure was repeated with all oil:alcohol molar ratios, reaction temperatures and reaction times. 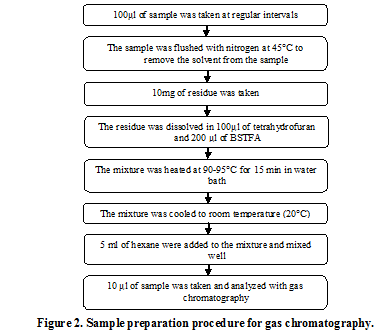 The procedure used to prepare the biodiesel sample for gas chromatography analysis is shown in Figure 2. A 100 µL aliquot was taken from the transesterification process and flushed with nitrogen in a microprocessor-controlled water bath (280 series, Fisher Scientific, Toronto, Ontario, Canada) at 45°C in order to evaporate the hexane. A 10 mg portion of the residue was dissolved in 100 µL of tertrahydrofuran and 200 µL of BSTFA. Then, the mixture to room temperature (20°C) for few minutes after which 5 mL of hexane was added. An aliquot of 1.5 ml mixture was transferred to the GC crimp vials and capped tightly for further analysis using Gas Chromatography. Statistical analyses were performed on biodiesel results using Minitab Statistics Software (Ver 16.2.2, Minitab Inc., State College, Pennsylvania, USA). Both analyses of variance (ANOVA) and Tukey's grouping were carried out. 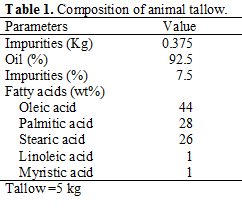 Table 1 shows the composition of the animal tallow used in this study. The filtration process removed about 7.5 % of the total weight of tallow as impurities present in the animal fats. The homogenized oil was characterized by gas chromatography to identify and quantify the fatty acid composition of the tallow. Five fatty acids were identified in the animal tallow: oleic acid (44%), palmitic acids (28%), stearic acid (26%), linoleic acid (1%), and myristic acid (1%). 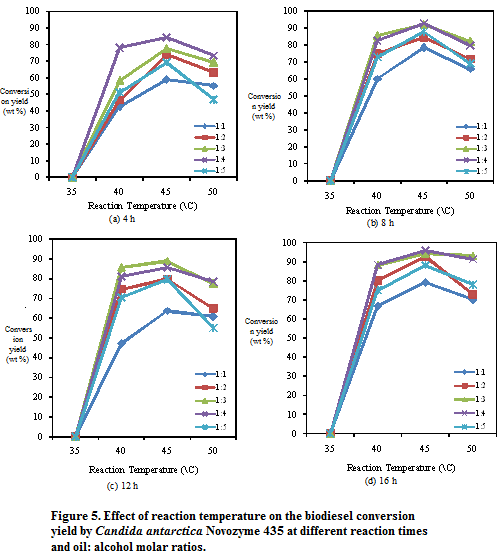 Enzymatic transesterification using the Candida antarctica Novozyme 435 was carried out to investigate the effects of reaction time (4, 8, 12 and 16h), oil : alcohol molar ratios (1:1, 1:2, 1:3, 1:4 and 1:5) and reaction temperature (35, 40, 45 and 50°C) on biodiesel yield in a solvent system (hexane). The results are shown in Table 2. Table 3 shows the Analysis of Variance performed on the oil yield data. The effect of oil:alcohol molar ratio, reaction time and reaction temperature were highly significant at the 0.001 level. All levels of interactions between the parameters were also highly significant at the 0.001 level. 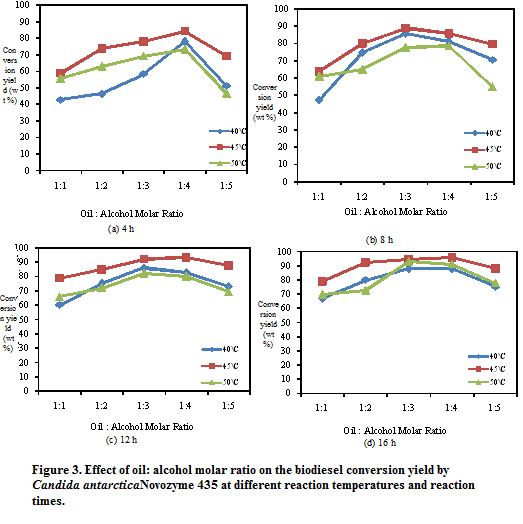 The results obtained from Tukey's Grouping (Table 4) indicated that the five levels of oil : alcohol molar ratio (1:1, 1:2, 1:3, 1:4 and 1:5) were significantly different from one another at the 0.05 level. The highest mean yield of 84.29% was obtained with the 1:4 oil:alcohol molar ratio. The four reaction times (4, 8, 12 and 16 h) were significantly different from one another at the 0.05 level. The highest mean yield of 83.54% was achieved with the 16h reaction time. The reaction temperatures 40 and 50°C were not significantly different from each other but were significantly different from the reaction temperature 45°C at the 0.05 level. The highest mean yield of 82.39% was obtained at the reaction temperature 45°C. 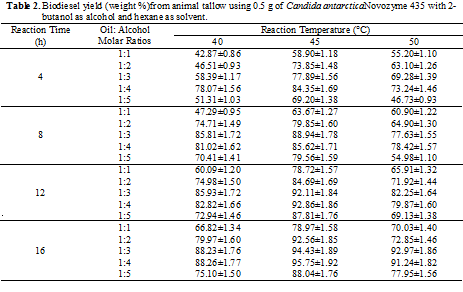 Figure 3 shows the effect of oil : alcohol molar ratio on the biodiesel conversion yield using the Candida antarctica 0.5 g of Candida antarctica Novozyme 435 with 2-butanol as Novozyme 435 at different reaction temperatures and reaction times. Generally, there was an increase in the biodiesel conversion yield when the oil:alcohol molar ratio was increased from 1:1 to 1:4 which was then followed by decreases with a further increase in the oil : alcohol ratio from 1:4 to 1:5 for all reaction times (4, 8, 12 and 16 h) and reaction temperatures (40, 45 and 50°C). The biodiesel conversion yield at the 4 h increased from 42.87 to 78.07% (82.13%), from 58.9 to 84.35% (43.20%) and from 55.20 to 73.24% (31.49%) when the oil : alcohol molar ratio was increased from 1:1 to 1:4 for the reaction temperatures of 40, 45 and 50°C, respectively. A further increase in the oil : alcohol molar ratio from 1:4 to 1:5 decreased the biodiesel conversion yield from 78.07 to 51.31% (34.27%), from 84.35 to 69.2% (17.96%) and from 73.24 to 46.73% (36.19%) for the reaction temperatures of 40, 45 and 50°C, respectively. Similar trends were observed with the 8, 12 and 16 h reaction times at all reaction temperatures (40, 45 and 50°C). Figure 4 shows the effect of reaction time on the biodiesel conversion yield using the Candida antarctica Novozyme 435 at different reaction temperatures and oil: alcohol molar ratios. Generally, there was an initial rapid increase in the biodiesel conversion yield with increases in reaction time during the first 4 hours which was then followed by a gradual increase till the end of the experiment (16 h) for all reaction temperatures (40, 45 and 50°C) and oil : alcohol molar ratios (1:1, 1:2, 1:3, 1:4 and 1:5). The biodiesel conversion yield at the 40°C reached 42.87%, 46.51%, 58.3%, 78.07% and 51.31% for the oil:alcohol molar ratios of 1:1, 1:2, 1:3, 1:4 and 1:5, respectively. Further increases in the reaction time from 4 h to 16 h, increased the biodiesel conversion yield from 42.87 to 66.82% (55.86%), from 46.51 to 79.97% (71.94%), from 58.39 to 88.23% (51.10%), from 78.07 to 88.26% (13.05%) and from 51.31 to 75.10% (46.36%) for the oil : alcohol molar ratios of 1:1, 1:2, 1:3, 1:4 and 1:5, respectively. Similar trends were observed at the 45 and 50°C reaction temperature and with the oil : alcohol molar ratios (1:1, 1:2, 1:3, 1:4 and 1:5). 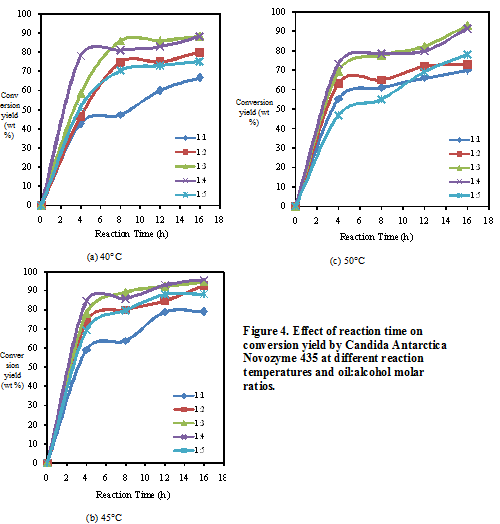 Figure 5 shows the effect of reaction temperature on the biodiesel conversion yield using the Candida antarctica Novozyme 435 at different reaction times and oil : alcohol molar ratios. There was an increase in biodiesel conversion yield when the reaction temperature was increased from 40 to 45°C which was then followed by a decrease when the reaction temperature was further increased from 45 to 50°C for all reaction times (4, 8, 12 and 16 h) and oil : alcohol molar ratios (1:1, 1:2, 1:3, 1:4 and 1:5). The conversion yield of biodiesel at the 4 h reaction time increased from 42.87 to 58.90% (37.39%), from 46.51 to 73.85% (58.78%), from 58.39 to 77.89% (33.39%), from 78.07 to 84.35% (8.04%), from 51.31 to 69.20% (34.86%) when the reaction temperature was increased from 40 to 45°C for the oil : alcohol molar ratios of 1:1, 1:2, 1:3, 1:4 and 1:5, respectively. A further increase in reaction temperature from 45 to 50°C decreased the biodiesel conversion yield from 58.90 to 55.20% (5.43%), from 73.85 to 63.10% (14.55%), from 77.89 to 69.28% (11.05%), from 84.35 to 73.24% (13.17%), from 69.20 to 46.73% (32.47%) for the oil : alcohol molar ratios of 1:1, 1:2, 1:3, 1:4 and 1:5, respectively. Similar trends were observed with the 8, 12 and 16 h reaction times at all oil:alcohol molar ratios (1:1, 1:2, 1:3, 1:4 and 1:5). 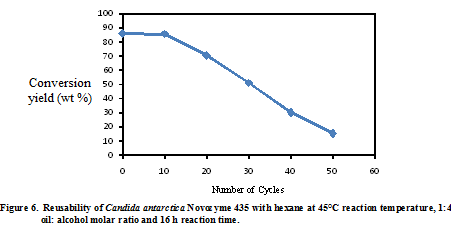 The effect of the number of enzyme cycles on the biodiesel conversion yield using Candida antarctica Novozyme 435 with 2-butanol and hexane at the optimum conditions (45°C reaction temperature, 1:3 oil : alcohol molar ratio and 8 h reaction time) is shown in Figure 6. There was a gradual decrease in conversion yield by the enzyme catalyst Candida antarctica Novozyme 435 with increases in the number of cycles beyond 10 cycles. When the number of cycles was increased to 10, the biodiesel conversion yield slightly decreased from 86.12 to 85.6% (0.6%). A further increase in the number of cycles from 10 to 50 decreased the biodiesel conversion yield gradually from 85.6 to 15.2% (82.24%). After melting and homogenizing the animal tallow, the impurities (7.5%) were removed by filtration. The fatty acids analysis indicated that the homogenized oil contained high percentages of oleic acid (44%), palmitic acid (28%) and stearic acid (26%) as well as lower percentages of myristic acid (1%) and linoleic acid (1%). A high concentration of oleic acid improves thecharacteristics of biodiesel resulting in high cetane index and combustion temperature . Biodiesel produced from feed stocks containing a high level of oleic acid showed similar characteristics to these of conventional diesel [9,11].Therefore, the biodiesel produced for oil extracted from animal tallow is expected to have good characteristics as a biofuel. The extracted oil can be transformed to biodiesel by chemical or enzymatic transesterification. Watanabe et al. , Dorado et al. and Kulkarni and Dalai  reported that oxidized oil can inhibit the chemical transesterification process and increase the oxidation of methyl esters. Kulkarni and Dalai  stated that an increase in the oxidation of methyl esters might increase the cetane number which tends to delay the ignition time in the engine. Nelson et al. and Watanabe et al. reported that oxidation in crude tallow oroil containing high free fatty acids is a common problem and no negative effects of the oxidized oil substrate on the enzymatic transesterification process was observed. Watanabe et al. stated that in the enzymatic transesterification process, the oxidized substrate becomes a non-recognition site for the enzyme to bind and the process continues with the substrates which are not oxidized. However, the authors stated that using oxidized oil might reduce the biodiesel stability. Nelson et al. reported that the stability of biodiesel can be increased by blending the biodiesel with conventional diesel especially in a cold environment. In this study, enzymatic transesterification was carried out and no oxidation stability test was performed on crude tallow or oil nor were antioxidants used. A high biodiesel conversion yield of 95.75% was achieved using the Candida antarctica Novozyme 435 at 25% enzyme concentration. Nelson et al. reported biodiesel conversion yield of 94.5% using immobilized Mucormiehei with tallow, ethanol at 25% of enzyme concentration. Kumariet al. reported biodiesel conversion yield of 96% using immobilized Pseudomonas cepaciawith mahua oil, ethanol at 25% of enzyme concentration. Kumar et al. reported biodiesel conversion yield of 95.75%) using the experimental enzyme NS88001with beef tallow oil, methanol at 25% of enzyme concentration. Increasing the oil:alcohol molar ratio from 1:1 to 1:4 at the 4 h reaction time increased the biodiesel conversion yield by 82.13, 43.20 and 31.49% and a further increase in the oil : alcohol molar from 1:4 to 1:5 at the 4 h reaction time decreased the biodiesel conversion yield by 34.27, 17.96 and 36.19% at the reaction temperatures of 40, 45 and 50°C, respectively. Kumariet al. noted that the biodiesel conversion yield increased when the oil:alcohol molar ratio was increased up to 1:4 and then decreased when the oil : alcohol molar ratio was further increased to 1:5. Chen et al. reported that increasing the oil : alcohol molar ratio from 1:1 to 1:4 promoted the methanolysis reaction with waste cooking oil, but the formation of methyl esters decreased when the oil : alcohol molar ratios was increased from 1:4 to 1:5 due to the excess of methanol in the system. The decrease in conversion yield of methyl esters from the oil substrate at higher oil : alcohol molar ratios might be due to the presence of insoluble methanol in the reaction system. Tamalampudi et al. suggested that excess alcohol would cause the active site on the surface of the lipase to be blocked resulting in the surface of the oil substrate being less accessible to the enzyme. Dizge and Keskinler  also reported that the use of excessive amount of alcohol might deactivate the lipase in the reaction. Chen et al. suggested that the excess alcohol might distort the essential water layer needed to stabilize the structure of the enzyme. In this study, increasing the oil:alcohol molar ratio from 1:4 to 1:5 deactivated the lipase catalyst and resulted in low conversion yield. It is likely that once the maximum level of esters was formed, a further increase in number of moles of alcohol decreased the formation of methyl esters in the reaction due to enzyme inactivation [23,26-30]. Several authors [31-34] reported that deactivation of enzyme occurred by the insoluble alcohol present in the reaction due to its tendency to be absorbed by the surface support matrix. However, theoretical 1:3 stoichiometric oil : alcohol molar ratio is needed to complete the reaction in the following continuous steps (a) the conversion of triglycerides to diglycerides, (b) the conversion of diglycerides to monoglycerides and (c) the conversion of monoglycerides to methyl esters and glycerol [12,35-36]. In this study, the optimum conversion yield was achieved at the 1:4 oil:alcohol molar ratio in a solvent system using Candida antarcticaNovozyme 435. Increases in the oil : alcohol molar ratio from 1:3 to 1:4 at 4 h increased the conversion yield of biodiesel for Candida antarctica Novozyme 435 by 82.13, 43.20 and 31.49% at the reaction temperatures of 40, 45 and 50°C, respectively. The lipase catalyst Candida antarctica Novozyme 435 used in this study, showed different activity due to the mass transferconditions, use of alcohol and solvent system. Based on the stoichiometric reaction, using an amount of alcohol equal to the number of fatty acids residues was sufficient to complete the conversion reactions. At the initial phase of the reaction, the enzyme, oil and alcohol appeared to be static and the reaction started when the stirring speed reached 200 rpm which promoted the initial mixing and increased the mass transfer between substrate and enzyme catalyst. Formation of esters increased with increases in reaction time from 1 to 4h. When the reaction time was increased from 4 to 16 h at the 40°C reaction temperature, the biodiesel conversion yield was increased by 55.86, 71.94, 51.10, 13.05 and 46.36% for the oil:alcohol molar ratios of 1:1, 1:2, 1:3, 1:4 and 1:5, respectively. The maximum conversion yield of 95.75 % was obtained at the 16 h. Nelson et al. , Chen et al. ( and Modi et al. observed similar trends for crude tallow, waste cooking oil and vegetable oil, respectively. Freedman et al. , Ma et al. , Leung and Guo, , Meter et al. and Eeveraet al. reported that the rate of conversion of fatty acid esters increased with increases in reaction time and the reaction proceeded rapidly with initial mixing which caused dispersion of alcohol into the oil substrate and the activation of enzyme. Chen et al. reported that after alcohol was dispersed, it rapidly interacted with fatty acids giving a maximum conversion yield. However, a further increase in the reaction time decreased the conversion yield due to the backward reaction of transesterification. Nelson et al. reported a maximum biodiesel conversion yield of 83.8 % at a 16 h reaction time with 1:3 oil:alcohol molar ratio using 25% concentration of the enzyme Candida antarctica(SP 435) with hexane and 2-butanol alcohol in the system. Chen  achieved a maximum biodiesel conversion yield of 85.12% after 30 h with 1:4 oil:alcohol molar ratio using 30% concentration of the immobilized enzyme Rhizopusoryzae and waste cooking oil as substrate. Modi et al. reported a maximum biodiesel conversion yield of 93.4% after 8 h with 1:4 oil:alcohol molar ratio using the enzyme Candida antarctica Novozyme 435 with vegetable oil. The biodiesel conversion yield obtained in this study was slightly higher than those reported in the literature and were achieved in a shorter time. When the reaction temperature was increased from 40 to 45°C with 4 h reaction time, the biodiesel conversion yield increased by 37.39, 58.78, 33.39, 8.04 and 34.86 % and a further increase in the reaction temperature from 45 to 50°C decreased the biodiesel conversion yield by 5.43, 14.55, 11.05, 13.17 and 32.47% for the 1:1, 1:2, 1:3, 1:4 and 1:5 oil:alcohol molar ratios, respectively. Chen et al , Dizge and Keskinler. , Rodrigues et al. and Nieet al. observed similar trends from waste cooking oil, canola oil, vegetable oil and salad oil, respectively. Chen et al  reported that the biodiesel conversion yield increased (reaching a maximum of 87%) when the reaction temperature was increased from 30 to 40°C and then decreased when the reaction temperature was further increased from 40 to 70°C during conversion of waste cooking oil to methyl esters using Lipozyme RM IM. Dizge and Keskinler  reported that the biodiesel conversion yield increased (reaching a maximum of 85.8%) when the reaction temperature was increased from 30 to 40°C and then decreased when the reaction temperature was further increased from 40 to 70°C while converting canola oil to methyl esters using Lipozyme TL. Rodrigues et al. reported a maximum biodiesel conversion yield of 53% at 35°C which then decreased with increases in reaction temperature above 35°C during the conversion of soybean oil to methyl esters using Novozyme 435. Nieet al. reported a maximum biodiesel conversion yield of 90% at 40°C which then decreased when increasing the reaction temperature above 40°C. In this study, the highest conversion yield were obtained at 45°C which was higher than those reported in the literature. Increasing the reaction temperature reduces the viscosity of the oil and enhances the mass transfer between the substrate and enzyme catalyst which results in higher conversion yield of biodiesel . Kumari et al. ( and Antczaket al. reported that the interactions between enzyme and substrate appears to be dependent on reaction temperature due to hydrogen bonding and ionic interactions which play an important role in maintaining the thermostability of lipase in the system. However, very high temperature may denature the specific structure of enzymes which results in a decrease in methyl esters formation. Denaturation of enzyme the support matrix may also promote the enzyme to leak from the outer layer of the support matrix . However, the optimum reaction temperature is dependent on other parameters such as oil:alcohol molar ratio, enzyme activity, stability and type of system used. In this study, a maximum biodiesel conversion yield of 95.75% was obtained by the Candida antarctica Novozyme 435 in the solvent system using hexane at 45°C and 1:4 oil : alcohol molar ratio. Mittelbach , Soumanou and Bornscheuer , Kumariet al. and Kumar et al. reported similar biodiesel conversion yields with solvent systems. Xu et al. and Shimada et al. reported that the decreases in biodiesel conversion yield in solvent-free system was due to the inactivation of lipase in the presence of insoluble methanol in reaction. Fjerbaeket al. ( and Antczaket al. reported that the use of organic non polar solvents for the transesterification process help to reduce the viscosity of the oil substrate, increase the mass transfer between the enzyme and the substrate and also helps to stabilize the enzyme in the reaction and reduce the toxicity of alcohol. Nieet al. reported that the organic non-polar solvents with a log P value greater than 2 are considered to be suitable in the transesterification reaction due to their hydrophobic property so that water cannot be stripped from the enzyme and the spatial conformation of the active site of the enzyme is maintained. The authors suggested that n-hexane (log P = 3.5) can preserve the catalytic reaction, thus increasing the biodiesel conversion yield. Lu et al. suggested that the n-hexane increased the biodiesel conversion yield with less water residue in the reaction and the non-polar solvent which promotes the usage of short chained alcohols like methanol (a polar alcohol). In this study, the activity of Candida antarctica Novozyme 435 in the presence of 2-butanol and hexane at the optimum conditions (a reaction temperature of 45°C, an oil: alcohol molar ratio of 1:4 and a reaction time of 16 h) remained relatively constant for 10 cycles and then decreased gradually reaching 11% after 50 cycles. Ghamguiet al. , Xu et al. , Bernardeset al. and Kumar et al. obtained similar results from immobilized LipozymeThermomyceslanuginosus, immobilized Lipozyme Rhizomucormiehei, immobilized Rhizopusoryzae and experimental enzyme NS88001, respectively. Several researchers [45,50,52] stated that repeated use of enzyme in the reaction without removing glycerol from the system might inhibit the interaction between the substrate and lipase. Xu et al. reported that while using methyl acetate as acyl acceptor, no glycerol was produced in the reaction with no loss of enzyme activity for 10 cycles in the reaction. The byproduct from the reaction was triacetylglycerol instead of glycerol which did not affect the product quality. The effectiveness of enzymatic transesterification of animal tallow using the Candida antarctica Novozyme 435 was studied. The effects of oil: alcohol molar ratio (1:1, 1:2, 1:3, 1:4 and 1:5), reaction temperature (35, 40, 45 and 50°C) and reaction time (4, 8, 12 and 16 h) on the biodiesel conversion yield were evaluated using n-hexane as a solvent. The highest conversion yield of biodiesel was obtained at the 1:4 oil:alcohol molar ratio, 16 h reaction time and 45°C reaction temperature. Increasing the oil : alcohol molar ratio from 1:1 to 1:4 increased the conversion yield of biodiesel by 21.24%. The rate of conversion of fatty acid esters increased with increases in reaction time. The reaction proceeds slowly at the beginning and then rapidly due to the initial mixing and dispersion of alcohol into the oil substrate and activation of enzyme. Increasing the reaction time from 4 to 16 h increased the conversion yield of biodiesel by 13.51%. The interactions between enzyme and substrate appears to be dependent on reaction temperature due to hydrogen bonding and ionic interactions which play important roles in maintaining the thermostability of lipase in the system. The higher temperature denatured the specific structure of enzymes and resulted in a decrease in methyl esters formation. Increasing the reaction temperature from 40 to 45°C increased the biodiesel conversion yield by 8.48%. Using n-hexane in the reaction helped to stabilize the enzyme and minimize the toxicity of alcohol. The activity of experimental enzyme catalyst in the presence n-hexane was slightly reduced after 10 cycles, it then decreased rapidly and stopped after 50 cycles. The research was supported by the Natural Sciences and Engineering Research Council (NSERC) of Canada. 30. Andre, L. F., I. N. Correa, C. O. Veloso and M. A. Langone, 2008. Enzymatic synthesis of biodiesel via alcoholises of palm oil. In: The 30th Symposium on Biotechnology forFuels and Chemicals, New Orleans, Louisiana, May 4-7. 48. Fjerback, N., K. V. Christensen and B. Norddahl. 2009. A review of the current state of biodiesel production using enzymatic transesterification. Biotechnology and Bioengineering, 102(5):198-315, doi:10.1002/bit.22256.